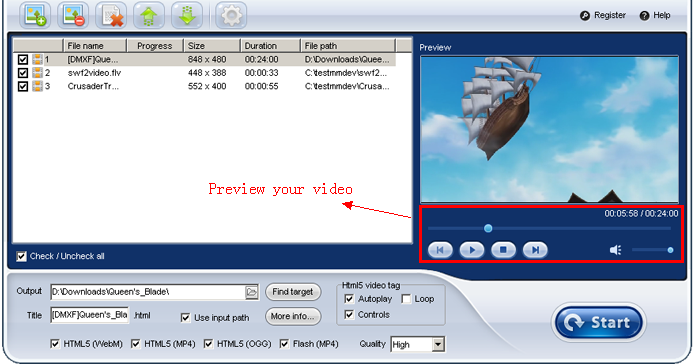 > Support > User Guide > How to use Video to HTML5 Converter? After launching the program, you will see the window below. Add video files (supports avi, wmv, flv, mov, rmvb, mpg, mp4, etc) you want to convert. You can play the video file you selected, mare sure it is the video you want to convert to html5. Click "More info..." to see more output setting. Choose html5 video format you need (different format supports different browsers). And you can also add a custom logo here. Once you've finished all the settings, click on "Start" button to start batch conversion.